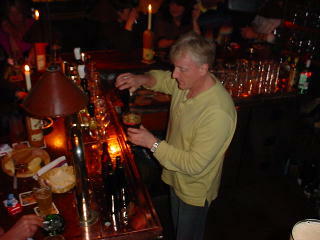 Join Owen Ogletree on a walk through of Amsterdam's popular 't IJ brewery tasting room on January 1, 2009. Video by Owen Ogletree of www.ClassicCityBrew.com. . 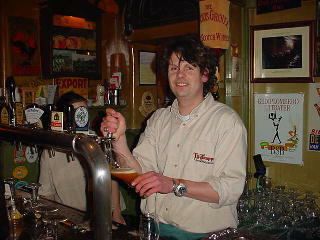 In February of 2003 Owen was lucky enough to lead a group of six friends on a wonderful beer tour of one of Europe's greatest beer cities -- Amsterdam! 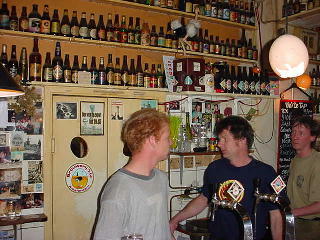 As of February, 2003 this webpage offers a very comprehensive summary of all the cafes, pubs, and breweries in Amsterdam that the beer lover should not miss. 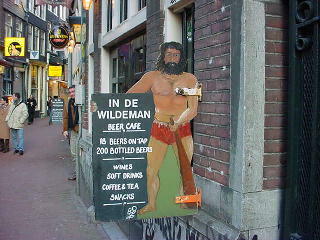 The map to the left shows very general areas of central Amsterdam where each pub is found. Numbers on the map match the individual locations of pubs that are discussed below. (Pub locations can be mapped more closely by going to the international section of MapQuest.com and making your own detailed walking maps.) Beer spots are listed here in the order that we visited them over three days. Print this page out and head to Amsterdam as soon as possible for a beer experience that you won't soon forget. Please note that opening times for these pubs are subject to change without notice. If you have experiences with any of these locations that you'd like to share, Owen always welcomes your e-mail and input. NEWS FLASH: The Beiaard beer cafe group has just announced that they have purchased the site of the closed Maximiliaans brewpub and plan to reopen it as a Beiaard brewpub late in 2003! This is great news for the Amsterdam beer community who will once again be able to enjoy two local brewpubs. 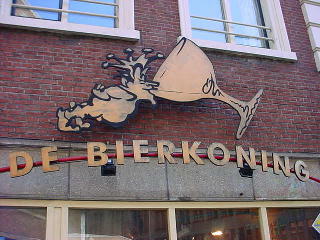 If you enjoy great beer, no trip to Amsterdam would be complete without a visit to this remarkable beer café. Its charm, atmosphere, and beer selection make it one of the best beer bars in the world. It is found (at times with some difficulty) on a small alley just off Oude Brugsteeg. There is a rare non-smoking room to the right of the main bar as one enters the front door, and only light snacks are offered. The beer selection is somewhere around 200 and includes draft selections from Belgium, the Netherlands, and the UK! I have always been impressed with the bartenders and staff at Wildeman -- they are interested in their customers and ready to talk about beer and recommend a selection. Fans of the Michael Jackson "Beer Hunter" television series from the late 1980's will recall the Trappist-style ale tasting that was filmed in the right bar. - Opens around noon most days, closed Sunday. 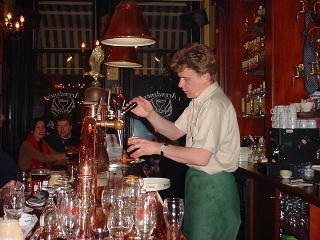 The photo to the right shows Robin, one of the fine staff at Arendsnest, pulling a glass of exquisite Dutch ale. Make it a special point to visit this extraordinary beer cafe that only serves Dutch brews. Our group was amazed as we looked at the beer list that includes so many craft beers from small breweries in the Netherlands that we had never before encountered! Peter van Arend is the owner of the Arendsnest (Eagle's Nest) and has a right to be proud of what he has accomplished here. If you are at a loss as to what beer to order, simply consult the staff who will be happy to make a suggestion. The list of beers we sampled here includes: Waddenbier (Dubbel from Friesland with hints of berry, toffee, and fruit), Buorren Bier (from De Friese brewery with a nice, sour, Flanders Brown Ale aroma and flavor), Birre Bier (honey beer with honey, spice, and cinnamon notes), Haerlemsch Brewery Old Ale (more like an Imperial Stout and Barleywine combination), Hertog Jan Grand Prestige (chocolate, plum, rich malt notes), Jopen Hoppen (hoppy, dry, fruity and spicy), X-Porter (made by homebrewers who contract with a brewery to produce this effervescent beer with espresso/chocolate character), Czaar Peter (sweet, rich, and chocolate-like with 8.5% abv), Stadsbrouwerij De Hemel (beer "from heaven" with a spicy, malty, buttery, rich taste of a big Tripel), and Oster (flavors of Porter and clove from a northern fishing village). 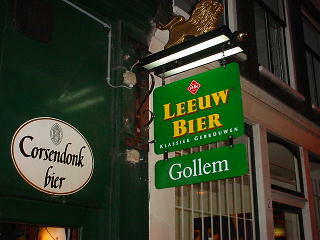 If all this beer arouses your appetite, the Lieve restaurant next door has Belgian/Dutch food and a good beer selection. - Arendsnest opens at 4 PM daily. 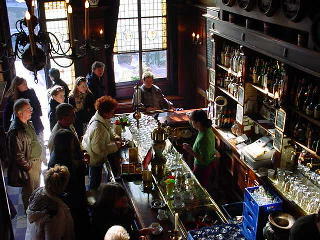 This pleasant pub is in the area of Amsterdam near the Rembrandt and Van Gogh museums. It has an appealing menu and a good beer selection that includes seven taps (La Chouffe, Affligem, Maredsous, Dekoninck, and one beer from 't IJ brewpub being standouts) and around ten bottles (including Girardin Gueze, Westmalle Dubbel and Tripel, Hoegaarden, Orval, Rochefort 8, Forbidden Fruit, and two products from Chimay). 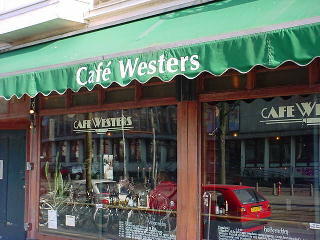 This is a quiet café during the day that can become quite busy in the evening. - Opens around 11 am daily. 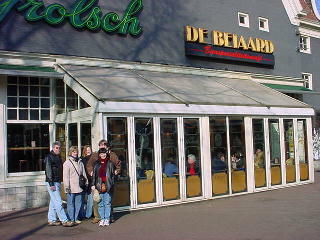 The photo to the left is of Dean, Gail, Kerri, Jeff, and Erin outside the Beiaard pub near the center of Amsterdam. To the right is one of the friendly and helpful staff who are glad to help you make a selection from over 60 delicious beers. The café has large windows that overlook the happenings on the street and a bright, glass-enclosed sitting area. Beiaard is part of a respected line of pubs in Amsterdam that has recently purchased the closed Maximiliaans brewpub (which they plan to reopen later in 2003 with their own line of house brews). 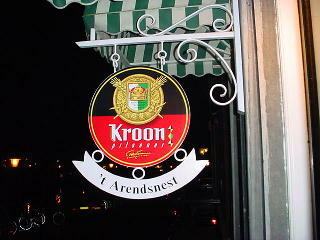 This interesting pub is near Kloveniers Burgwal canal and has a "smoke menu" along with a very decent selection of beer. Westmalle Dubbel and Tripel, Hoegaarden Gran Cru and Duvel highlight the beer menu. The place is very cozy, smoky, quiet and relaxing. 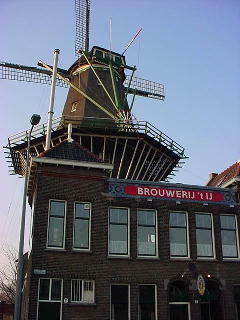 It is just down the street from the former location of the now defunct Hoogte pub that is mentioned in many beer guides. -Opens around 4 PM daily. demand from the crowds at the bar. This unique brewpub definitely ranks as one of the top beer destinations in the world -- it brews its beer under a windmill in a space that used to be a public bath house. The opening hours are very limited, and visitors should always expect a large crowd of locals and international beer hunters. Squeezing through the thick crowd of interesting folks to get a beer at the bar is part of the fun at this brewpub. The brewery was opened in the eighties by songwriter and homebrewer Kaspar Peterson and has a cool, funky atmosphere about it. You should try to grab a taxi over to this area of Amsterdam, as it is a pretty long walk from the center of town (just tell the cab driver you want to go to "the brewery under the windmill"). Try the Struis (9%), Columbus (9%), Zatte (an 8% Tripel), and Natte (a 6.5% Dubbel). Peanuts are also available at the bar for one euro. 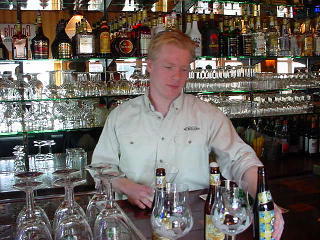 Ton Zijp, one of the bartenders at 't IJ also works as a salesperson at the Bierkoning beer store in Amsterdam and is a wealth of beer information (and a very friendly fellow). - Open from 3 PM to 8 PM Wednesday to Sunday. Walk left out of 't IJ and go to the first major road to find the Boulevard Cafe. This pub and restaurant offers a nice beer selection and several meals prepared with beer. 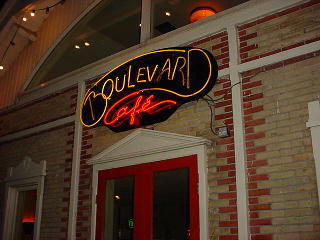 Boulevard has a helpful staff and a family atmosphere. It resides in part of an old train station. The beer menu is cased in metal and weighs around four pounds (the manager did this to prevent the menus from being taken by patrons). Be sure to try any appetizer or entree that includes Abbey cheese; and the ice cream made with Trappist beer is delightful alongside a glass of La Chouffe ale. - Opens at 10 AM Monday to Friday and 2 PM on Saturday and Sunday. Food is available between 5 PM and 9:30 PM. Once you are forced to leave 't IJ brewpub because of their limited hours, be sure to walk over to the "Green Elephant" pub which stays open much later. From 't IJ walk toward the Texaco service station across the street and then head down the street to the left of the Texaco. The pub is about three blocks on the left. The beer selection is a bit small, but very well thought out in this neighborhood pub. The layout of the place is split-level with a small upstairs area that overlooks the main bar. 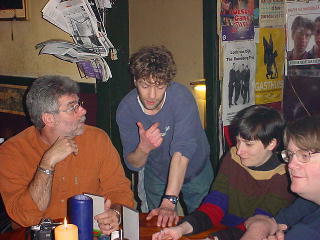 A bartender (standing) is going over the beer menu with Dean, Erin and Jeff in the photo above. - Open from 11 AM until around 1 AM daily. This narrow pub with a small upstairs area has six taps (Heineken, Vos, Wieckse Witte, Affligen Blond and Dubbel, and a rotating beer from Gouden Carolus when we visited) and five decent bottled beers including Westmalle Tripel and Duvel. 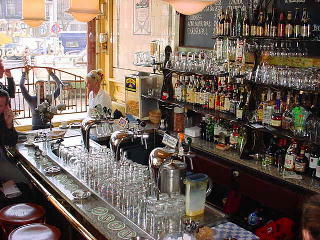 Smalle is found in a quiet area of Amsterdam to the west of the central Dam square. I have heard from others that the food here is quite good, but the staff was shorthanded and stressed-out the day we visited, so food was not available. - Opens at 10 AM seven days a week. 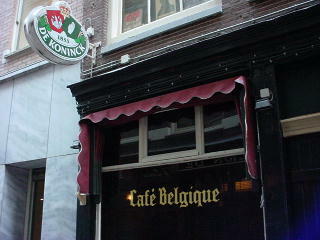 This Belgian pub is very near touristy Dam square and includes a respectable list of almost 50 Belgian beers. Trappist cheeses and sandwiches are available, and seating is very limited. On the day we visited the beers were served a bit too cold and in the wrong glasses. Nevertheless, the beers were delicious and the experience was enjoyable. - Opens around 4 PM and is closed on Tuesday. 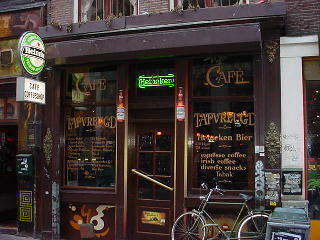 This beautiful café is located on Nieuwmarkt square and offers 15 bottled beers and nine drafts. Bottled selections include: Westmalle Dubbel and Tripel, Duvel, Brugse Tripel, and Hoegaarden Gran Cru. La Chouffe and a few of the IJ beers highlight the taps. Be careful when you order a beer here -- on the day we visited four out of six beers brought to our table were not what we ordered. Beer prices are quite low, however. Food at Loosje is quite good with sandwiches, salads, hard rolls, tortillas, and soups being mainstays on the menu. - Opens around 10 AM daily. 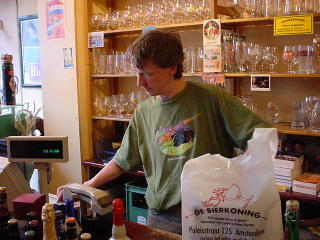 Ton Zijp will answer your beer questions at Bierkoning. If there is space in your luggage to bring excellent beer home with you, be sure to make a trip to the Bierkoning retail beer store. This is one of the best beer stores in the world -- it boasts a remarkable selection of ales and lagers from around the world. You'll also want to check out the array of beer glasses for sale behind the cash register. The downstairs nook offers ciders, fruit beers, and Belgian Lambics, while the upstairs shopping area contains Trappist beers, Dubbels and Tripels, Barleywines, Belgian Ales, Scotch Ales (oh my, the list goes on and on). The staff is very helpful and is more than willing to discuss which beers are right for your tastes. All major credit cards are accepted (with an added 5% service charge). - Opens around noon daily and closes in the late afternoon. This small brewery is outside the center of Amsterdam in an industrial zone to the south -- it is easily reachable by taxi for around 25 euros (in 2003). 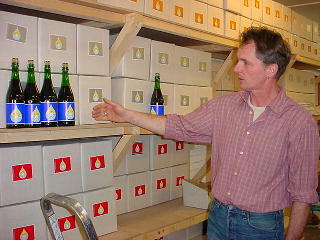 In the picture above and to the left is co-owner Arno Kooy showing off bottles and cases of the De Prael beers. 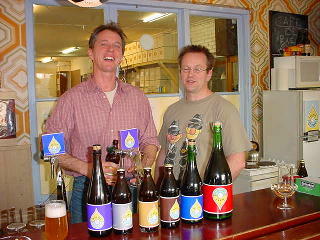 Above and to the right are Arno and brewer/co-owner Far Kok. Arno and Far once worked with patients at a local mental hospital, and their love for homebrewing compelled them to open De Prael. They are still tied to the hospital, however, because the brewery provides some rehabilitative employment to a few patients who enjoy the experience of packaging and labeling the beers. Not only does this brewery provide a valuable community service, but they produce excellent Dutch and Belgian styled ales. The beers are named after old Dutch singers of tear-jerking songs: Johnny (5.7% blonde ale with wheat and spicy phenol character - unfiltered and unpasteurized), Heintje (5.4% Wit beer with wheat and malt -- like a nice Hefeweizen with clove and banana character), Mary (9.6% Belgian Strong Dark Ale with delightful notes of figs, toffee, raisin, pepper, and alcohol), and Willy (8.5% winter beer with candi sugar, Hallertau hops, and pilsner, Munich, caramel, and chocolate malts). Seasonal beers are also produced. It is quite odd that this brewery exists completely on the second floor of their building! Tours that include a tasting can be prearranged for four euros per person. Please be sure to purchase and support these delicious craft brewed beers! Our group absolutely loves De Zotte. 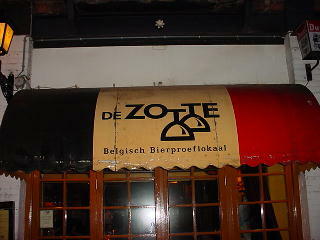 Found near Leidseplein, Zotte is on a quiet side street to the southwest of the center of Amsterdam. This is definitely a Belgian pub with a wide array of Belgian Ales, Belgian staff, and incredible Trappist cheese tarts (Abdijkaastaarts). Try pairing a Trappist ale with a huge platter of Trappist cheeses (usually Orval and Chimay). It is quite fun to sit at the center of the bar at Zotte and watch the bartenders pour the wonderful beers into their beautiful glasses. Don't miss this pub -- it is worth searching out! - Opens around 4 PM. Gollem is a classic brown café (with walls stained brown from years of smoke) that just happens to have one of the very best beer selections in the city. Amsterdam's beer fans and beer tourists love this place. For many years Gollem has proudly featured a huge beer menu that includes many hard-to-find examples (such as the rare Westvleteren Trappist ales from Belgium). The photo above and to the right shows the bartender carefully pouring our heavenly Westvleteren 12. Trappist cheeses are also available. The atmosphere here is friendly, cozy, and candle-lit. 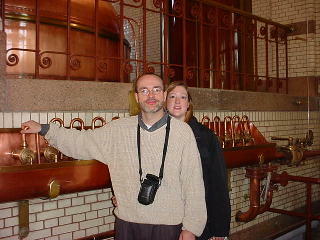 Owen and Kerri admire the old brewing equipment. 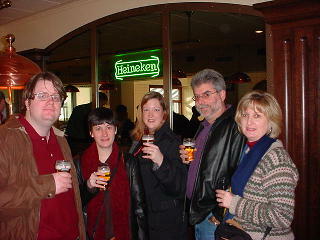 Jeff, Erin, Kerri, Dean, and Gail toast our great beer journey to Amsterdam. The old Heineken brewery near the center of Amsterdam is now a multi-media museum. For 7.50 euros per person participants can experience all manner of Heineken history and displays. The beautiful horses that still pull the Heineken carts through town are here, along with the old brewing tanks and mash vessels. An over-the-top virtual "ride" through the Heineken bottling line is an experience you'll not soon forget. Three small glasses of Heineken (or soft drinks) are offered as you meander through the experience, and a souvenir glass is presented upon your departure. No beer fan should miss this elaborate and entertaining diversion. - Open from 10 AM to 6 PM Tuesday to Sunday. Elfde Gebod, 5 Zeekijk, ph. 20-622-3577. Good beer selection near the central train station. Geneugten, 54 Kerkstraat, ph. 20-625-0934. Brown café near Leidseplein with an interesting selection of beers in 750 ml bottles.